“Global house price boom accelerates further, led by Europe, North America, and some parts of Asia Pacific”, according to the Q3 2015 quarterly note from the Global Property Guide. This house price boom is reflected in two measures. First, real house prices rose in 28 out of a sample of 41 countries. Second, there is stronger upward momentum—in 22 countries house prices have risen faster compared to the previous quarter. 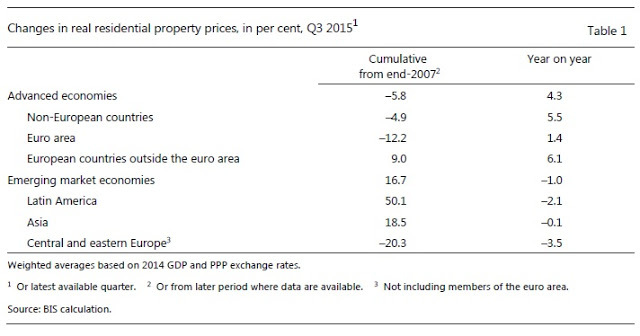 These results are also in line with the Q3 2015 data reported by Knight Frank. Of the 55 housing markets tracked by Knight Frank, 82 percent recorded positive annual price growth, up from 75 percent. However, FITCH notes that even though the housing and mortgage outlook for the 22 countries remain stable/positive, divergence is increasing. Looking at global house price developments in more detail, the Bank for International Settlement (BIS) says that real house prices increased by 4.3 percent year-on-year in advanced economies vs. a decline of 1.0 percent in emerging market economies. Within emerging market economies, the BIS notes that “there were significant disparities across countries: while prices continued to rise strongly in Hong Kong SAR, India and Turkey, they kept falling in Brazil, China and Russia.” Going forward, “the EM house price boom will be curbed by slowing income growth and weaker economic prospects”, says Oxford Analytica. In the Euro area—where house price data coverage is higher compared to other regions—house prices rose by 2.3 percent in the third quarter of 2015 compared with the same quarter of the previous year, according to Eurostat. On the outlook for Europe, FITCH says that “Rising GDP, low rates, recovering credit flows, and improving labour markets will support the bounce-back in the eurozone periphery.” Moreover, according to Urban Land Institute’s Emerging Trends Europe, the five leading cities for investment prospects in 2016 are Berlin at Number 1, followed by Hamburg, Dublin, Madrid and Copenhagen.